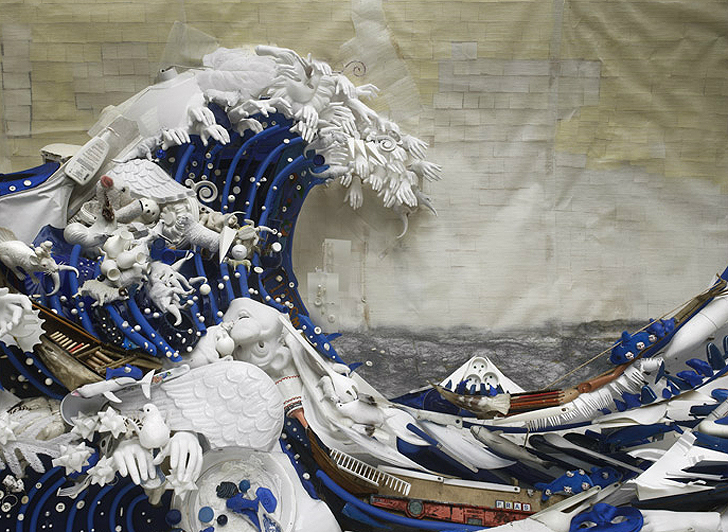 Artist Bernard Pras knows how to turn trash into treasure. 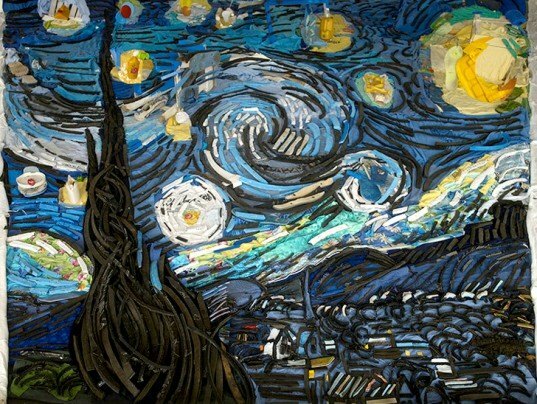 The French artist recreates classic masterpieces, entirely of recycled materials! Pras' epic installations portray everyone from Marilyn Monroe to the King of Pop, and he even recreates classic paintings like Dali’s self portrait and "The Scream." From afar, each of Pras’ pieces appear like seamless paintings. Hokusai’s classic “The Wave” crests with white caps, and Van Gogh’s infamous “Starry Night” swirls in hues of blue and yellow. But look closer and we see that Pras doesn’t use paint or paper for his collages, but instead hundreds of pieces of discarded trash. One can marvel at Pras’ creativity when taking a survey of his recycled materials. Old shoes, doll hands, colored wires, loose beads, potato chip bags and toilet paper rolls are hardly recognizable with the artist’s expert arranging. The arrangements are then photographed, and displayed as a two dimensional image. Yet when we do finally notice that can of Pringles or a cast-off Barbie doll, we realize the grandiose (or sometimes more modest) scale of Pras’ installations. These collages, which made up of stacked objects, follow the historic tradition of anamorphosis. Pras gives an eco spin on the craft by using his pieces to not only creating realistic portrayals of his subjects, but drawing attention to the massive collection of trash used to form each piece. The resulting images are both commanding in form and medium, giving new life to pieces normally bound for the landfill. From afar, each of Pras’ pieces appear like seamless paintings. Hokusai’s classic “The Wave” crests with white caps, and Van Gogh’s infamous “Starry Night” swirls in hues of blue. But look closer, and we see that Pras doesn’t use paint or paper for his collages, but instead hundreds of pieces of discarded trash. One can marvel at Pras’ creativity when taking a survey of his recycled materials. Old shoes, doll hands, colored wires, loose beads, potato chip bags and toilet paper rolls are hardly recognizable with the artist’s expert arranging. The arrangements are then photographed, and seen as a two dimensional surface. Yet when we do finally notice that can of Pringles or cast off Barbie doll, do we realize the grandiose (or sometimes more modest) scale of Pras’ installations. These collages, which are figures or imagery made up of stacking other objects, is the historic tradition of anamorphosis. Pras gives an eco spin on the craft by using his pieces to not only creating realistic portrayals of his subjects, but drawing attention to the massive collection of trash used to form each piece. The resulting images are both commanding in form and medium, giving new life to pieces normally bound for the landfill.